This paper discusses concentrations of 5 essential trace metals (chromium, copper, iron, manganese and zinc) in water, sediment and various fish (C. gariepinus) tissues. With the exception of high Zn concentrations in skin, the highest essential element metal concentrations were generally recorded in liver and gill arch tissues, followed by gill filaments and lastly skin and muscle. This general trend is in agreement with trends reported by other workers. Fe concentrations were found to be significantly higher at the Vaal Dam more often than at the Vaal Barrage. In comparison, Mn concentrations were higher at the Vaal River Barrage more often than at the Vaal Dam. No clear trends emerged with regard to differences between localities for the other metals, or between surveys/seasons for all essential trace metals examined. The likely reason for the lack of distinct trends is the amount of variability observed in tissue metal concentrations within localities and seasons in this study. Such variability is also reflected in current literature and accentuates the importance of both abiotic (e.g. physical water quality variables) and biotic (e.g. host physiological status, general biology and life history traits) factors influencing the concentrations and bioavailability of trace metals. There is increased public awareness regarding aquatic pollution, including metal pollution (Strydom et al., 2006). Heavy metals can be defined as 'electropositive elements having a density of greater than five' (Roebuck, 1992). This definition invariably lumps together 40 metals of different properties and degrees of acute and chronic toxicity (Roebuck, 1992). With regard to the periodic table, the transition elements are generally termed 'heavy metals' or simply 'metals' (Sorensen, 1991). While there has been some debate regarding the use of the term 'heavy' (Strydom et al,. 2006), the terms 'heavy metal' and 'metal' are used interchangeably in this paper. Metal contamination of the environment may emanate from a variety of point sources of pollution, including mining and industrial activity (Kamau, 2002; Strydom et al., 2006; Van Aardt and Hough, 2007; Ayandiran et al., 2009), power generation, irrigation, sewage purification/treatment works (Coetzee et al., 2002), leachates from landfill sites (Moodley et al., 2007), motorboat exhausts (Van Aardt and Erdmann, 2004), leaching from domestic waste products associated with informal settlements (Jackson et al., 2007), other residential areas (Jackson et al., 2009), shooting ranges (Heier et al., 2009) and agricultural activities (Ali and Fishar, 2005). Metal effects on central metabolic pathways may have a major detrimental impact on both human and animal life (Strydom et al., 2006; Castro-González and Méndez-Armenta, 2008; Pandey et al., 2008). Metal accumulation has also been employed as an impact assessment tool with reference to fish health (e.g. Deviller et al., 2005; Shah and Altindag, 2005), fish community structure (e.g. Bervoets et al., 2005; Allert et al., 2009) and aquatic ecosystem health (e.g. Birungi et al., 2007; Nesto et al., 2007; Prasath and Khan, 2008; Shinn et al., 2009). Apparent biomagnification of trace metals has also been demonstrated to occur in some cestodes parasitising fish, making these organisms even more sensitive biological indicators of long-term metal pollution exposure (e.g. Woelfl et al., 2008; Retief et al., 2009; Oyoo-Okoth et al., 2010). This is the second paper in a series of 2 papers reporting on concentrations of 9 metals (strontium, aluminium, chromium, copper, zinc, manganese, iron, lead and nickel), as determined in 5 tissue types, namely, skin, muscle, gill arch, gill filament and liver of the sharptooth catfish (Clarias gariepinus) from the Vaal Dam. The first paper dealt with the non-essential trace metals, aluminium (Al), lead (Pb), nickel (Ni) and strontium (Sr) (Crafford and Avenant-Oldewage, 2010). In the first paper a comprehensive synopsis was provided, including a discussion on various factors that may affect heavy metal accumulation. As a result the same information will not be duplicated here. Chromium (Cr), copper (Cu), iron (Fe), manganese (Mn), and zinc (Zn) are regarded as essential trace metals (Galvin, 1996), and are reported on in this paper. While the essential trace metals play a vital role in many physiological processes, they can potentially have a toxic effect when present in high concentrations. Determining tissue concentrations of these metals may allow possible effects on the health of fish (and humans that consume them) to be inferred. Catfish are particularly suited to bioaccumulation studies as they are bottom feeders and are readily exposed to metals that accumulate in sediment. These bottom-dwelling omnivores also actively feed on a wide variety of prey including small fish (Skelton, 2001). As predators they may thus also accumulate metals from surrounding water or from feeding on other fish (Kidwell et al., 1995). The data gathered during the study were compared between a polluted (Vaal River Barrage affected by industrial, mining and domestic effluent) and less polluted (Vaal Dam located in the upper catchment) locality. Trace metal concentrations in sediment and water samples (Institute for Water Quality Studies, Department of Water Affairs and Rand Water Board database) were also recorded during each survey. Chromium (Cr) is involved in glucose metabolism as an insulin co-factor and also increases protein and amino acid uptake by cells (Galvin, 1996). The main sources of Cr to the environment are effluents from the production of corrosion inhibitors and pigments (Galvin, 1996), electroplating and metal finishing industries, municipal water treatment plants, tanneries, oil drilling operations and cooling towers (Eisler, 1986). High concentrations can cause skin alterations, pulmonary problems and even cancer in humans (Galvin, 1996). Under laboratory conditions chromium is mutagenic, carcinogenic and tetragenic to a wide variety of organisms (Eisler, 1986). Other sublethal effects include: histopathological damage, altered blood parameters such as haematocrit, serum protein levels, and blood glucose levels, decreased enzyme activity and impaired respiratory and locomotory activities (Holdway, 1988). Some degree of toxicity for solutions containing only about 5 mg/ℓ has been reported (Trama and Benoit, 1960). Chromium is however generally deemed to be of low importance as a pollutant in the freshwater environment (Lloyd, 1992), since it is less toxic than metals like silver, cadmium, copper and lead (Khangarot and Ray, 1990; Flos et al., 1983). Copper (Cu), as an essential trace element, is involved jointly with cobalt and iron in the production of haemoglobin and erythrocytes (Galvin, 1996). It is also involved in bone and nervous system formation and is contained in some enzymes (e.g. cytochrome and ascorbic acid oxidase) (Galvin, 1996; Sorensen, 1991). High concentrations of copper can alter haematology (James et al., 1998), respiratory and cardiac physiology (Sorensen 1991), and may also lead to retarded growth and inhibition of spawning (Benoit, 1975). Concentrations as low as 5.3 to 31.9 mg/ℓ in soft waters may be toxic to larval fish (depending on the pH and dissolved organic carbon and calcium concentrations) (Welsh et al., 1996). Iron (Fe) is the fourth element in order of abundance on the earth (Galvin, 1996). As such its abundance in the inorganic world stands in stark contrast to its sparing concentration in living cells (Neilands, 1973). Its presence in water originates from rock dissolution and minerals, as well as steel production and other industrial wastewater (Galvin, 1996). As an essential element Fe is known for its presence in proteins (e.g. haemoglobin), cytochromes and several redox enzymes (Galvin, 1996). In humans ingestion of high amounts of Fe cause irreversible disruptions in several tissues (Galvin, 1996). It can also be toxic to fish like Tilapia sparrmanii, where it alters the routine oxygen consumption (Grobler et al., 1989). Fe is also bio-concentrated in the blood of Tilapia sparrmanii (Grobler-Van Heerden et al., 1991). Manganese (Mn), as essential micronutrient, is a constituent and activator of many enzymes in animals (Martin, 1974). It is widely diffused in nature, and can easily be dissolved by acid solutions (Galvin, 1996). At high concentrations it is toxic to fish, resulting in decreased liver glycogen levels and increased blood glucose levels (Nath and Kumar, 1987). Zinc (Zn), commonly used as an anti-rust agent, in the galvanizing industry, for paint production and in the textile industry, is also an essential element (Galvin, 1996). In a review on metals in the aquatic environment, Galvin (1996) discusses the function of Zn as an element essential to life. It is present as Zn-cysteine and Zn-histidine in several amino acids. It is also present in numerous enzymes, such as alcohol dehydrogenase (ethanol metabolism), carboxy peptidase (protein metabolism) and carbonic anhydrase. In the latter zinc plays a role in binding carbon dioxide in teleost cells, combining it with water to form carbonic acid, and releasing carbon dioxide from capillaries at secondary lamellae of the gills (Sorensen, 1991). At excessive concentrations it can cause growth retardation, histopathological alterations, respiratory and cardiac alterations, inhibition of spawning (Sorensen, 1991, Brungs, 1969), damage to gill epithelium (Lloyd, 1960, Skidmore, 1970) resulting in gill tissue hypoxia (Burton et al., 1972), and changes in blood variables (Lewis and Lewis, 1971; Gatlin et al., 1989). Cutthroat trout have been shown to avoid water with a Zn concentration of 28 mg/ℓ (Woodward et al., 1997), before effects on survival and growth were noted. Surveys were conducted bimonthly at 2 localities: the former RAU Island (now UJ island) in the Vaal Dam (S 26º 52.249', E 28º 10.249') and the Vaal River Barrage near the Barrage wall (S 26º 45.786', E 27º 41.280'). Surveys were conducted during the following months: November 1998, January 1999, March 1999, June 1999, August 1999, October 1999 and February 2000. Water quality in the Vaal River Barrage is poorer than that of the Vaal Dam due to increased levels of urban, industrial, mining and agricultural effluent and runoff (Crafford and Avenant-Oldewage, 2009). Integrated water samples from 0-5 m were obtained with the aid of a modified hosepipe. Sediment samples were obtained with the aid of a sediment corer. The Department of Water Affairs Institute for Water Quality Studies (Roodeplaat Dam, Pretoria) performed all water and sediment trace metal analyses. Rand Water Board also made available data on trace metal analyses resulting from their monitoring activities. 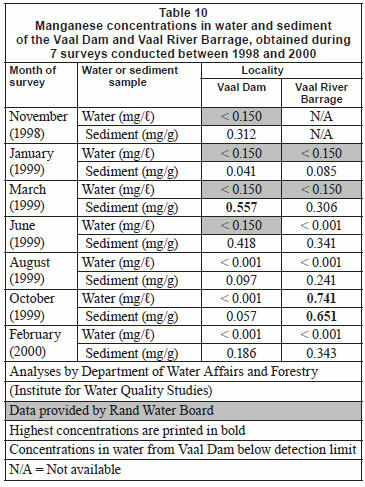 Data from the following Rand Water Board sampling points were used: C-VD1I (Rand Water Board inlet at the Vaal Dam wall) and C-VRB0T (upstream at the Vaal River Barrage). During each survey 20 C. gariepinus were collected at both localities with the aid of gill nets (stretched mesh sizes 90, 110 and 130 mm.). Fish were transported back to land in a 'live well' (i.e. water-filled chamber on the boat through which water was circulated) and transferred to a holding tank (through which dam or river water was also continuously circulated). Fish were weighed, measured, placed on a polypropylene dissection board and killed by severing the spinal cord behind the head. The following tissues or organs were removed: liver, skin, muscles and gills (filaments attached to arch). For each tissue type an adequate amount (i.e. enough to fill the 25 mℓ glass bottle in which it was stored) was collected. Samples were kept on ice before being transferred to a deep freezer at the end of each day. The frozen samples were transported to the laboratory. In the laboratory samples were allowed to thaw at room temperature. Approximately 5 g of wet tissue (liver, skin and muscle) were weighed in an Erlenmeyer flask with the aid of a Mettler PK 4800 scale. This corresponded to approximately 1 g dry weight. Samples were subsequently dried, digested and analysed using a Varian Atomic Absorption Spectrophotometer (SPECTRA AA-10), as described by Crafford and Avenant-Oldewage (2010). The low tissue concentrations recorded in the current study were expected, especially when considering the low Cr concentrations recorded from water (Table 1). In the Vaal Dam Cr was accumulated in the different tissues (Table 2), in order of decreasing concentration as follows: gill filament > gill arch > skin > liver > muscle. In the Vaal River Barrage, the decreasing order of Cr concentrations in tissues was: gill arch > gill filament > skin > muscle > liver. No seasonal trends were evident (Tables 2 and 3). 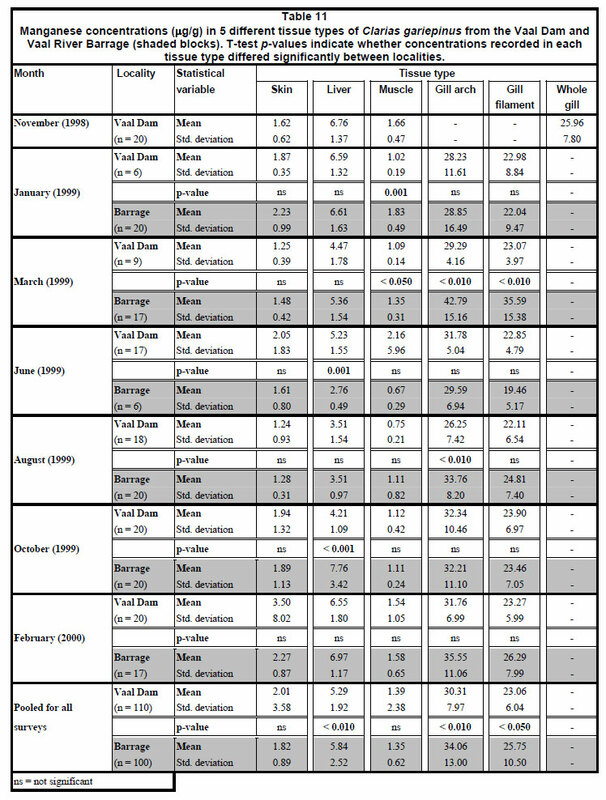 Copper sediment and water concentrations (all but one below the respective detection limits) are summarised in Table 4. 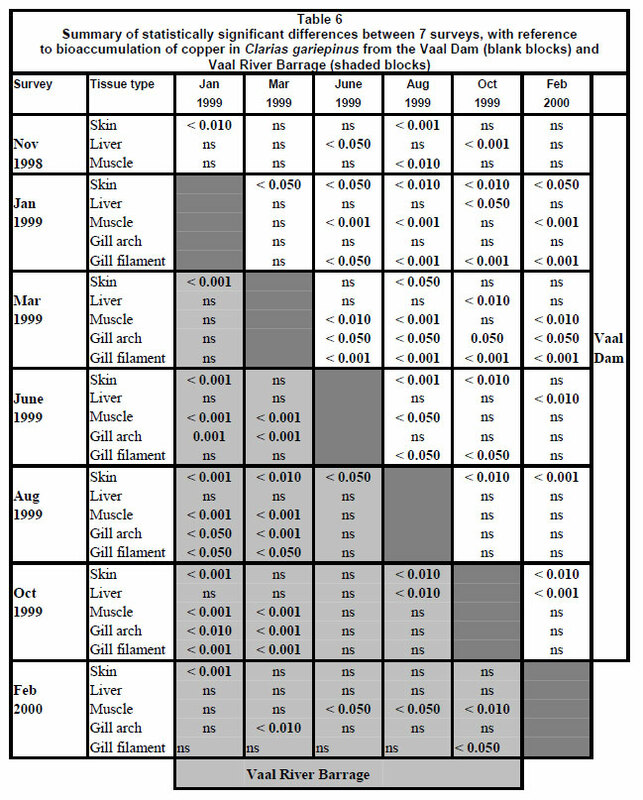 The same trend was observed from both the Vaal Dam and Vaal River Barrage for Cu concentrations in the different tissues (Table 5): liver > gill filament > gill arch > muscle > skin. Cu concentrations recorded in liver tissue were much higher than that recorded in the other tissues. Concentrations in the remaining tissues were similar. Seasonal trends in differences in metal tissue concentrations between localities were not evident (Tables 5 and 6). 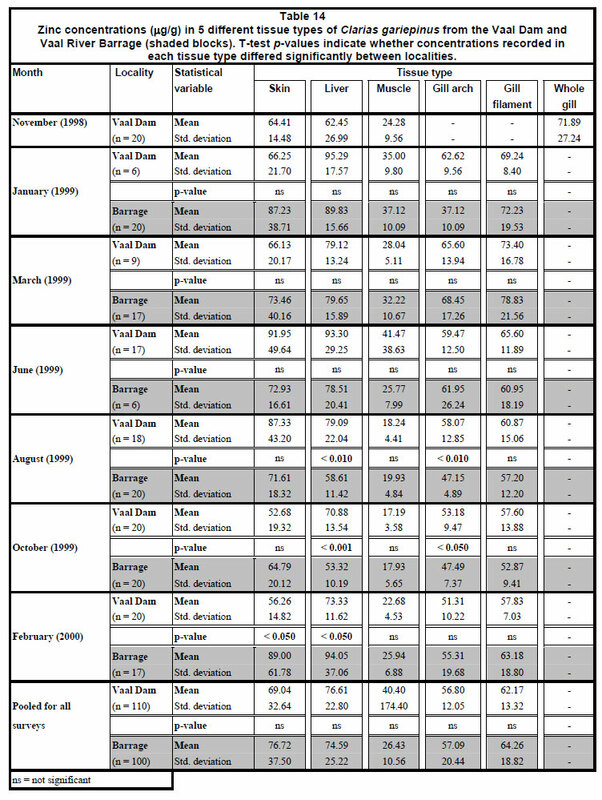 Iron concentrations in water and sediment are summarised in Table 7. The ranking of tissues and organs in terms of iron concentration (Table 8) were: Vaal Dam - liver > gill filament > skin > gill arch > muscle; Vaal River Barrage - liver > gill filament > gill arch > skin > muscle. Seasonal trends in differences in metal tissue concentrations between localities were not evident (Tables 8 and 9). 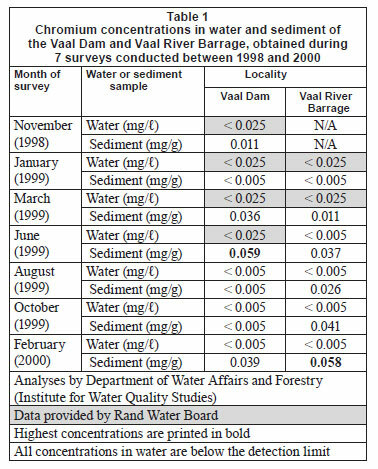 Manganese concentrations in water from the Vaal Dam were below the limits for detection during all surveys (Table 10). 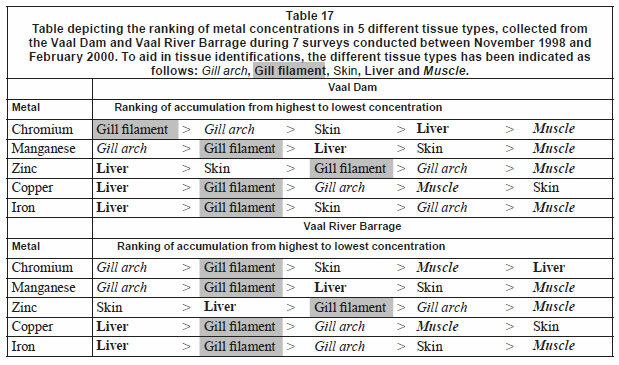 Concentrations recorded in the different tissues (Table 11), listed in decreasing order, were the same for both localities: gill arch > gill filament > liver > skin > muscle. With regards to significant seasonal differences within the localities no clear trends emerged (Tables 11 and 12). Zinc concentrations in water from both localities were below the limits for detection during all surveys (Table 13). 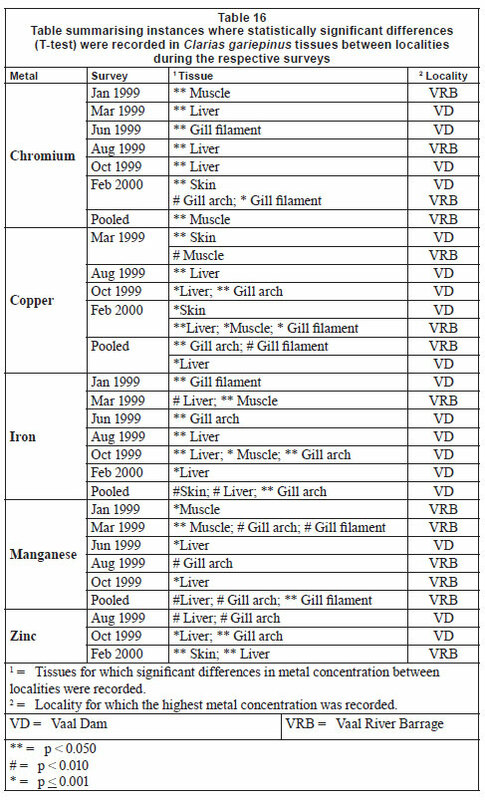 Concentrations recorded in the different tissues (Table 14), listed in decreasing order, were: Vaal Dam - liver > skin > gill filament > gill arch > muscle; Vaal River Barrage - skin > liver > gill filament > gill arch > muscle. No clear seasonal trends emerged (Tables 14 and 15). Readings and concentrations of 6 variables that may influence metal availability are given in Fig. 1. Peak flow readings in cubic metres per second were obtained from the Department of Water Affairs database (recorded from the De Vaal Schoemansdrift gauging weir, Station Number C2H018-A01). Some of the readings, as indicated in the tables listed earlier, have been obtained from Rand Water Board and others from the Department of Water Affairs. As a result 2 detection limits have been recorded for the same metal in many cases. It should be noted that this may give rise to 'false' trends. Concentrations of the 5 metals under review in sediment and water can be divided into 3 categories. Very low concentrations (mostly below the detection limits) of Cu were recorded in both sediment and water at both localities (Table 4). In the case of Cr and Zn, most water concentrations were below detection while low concentrations were recorded from sediment (Tables 1 and 13). 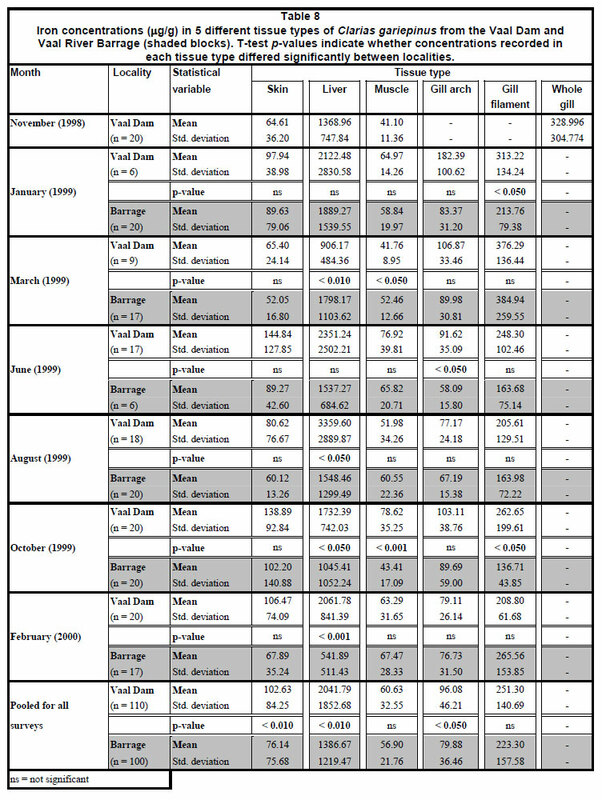 For Mn and Fe high concentrations were recorded from sediment, while most concentrations in water were found to be below detection (Tables 7 and 10). 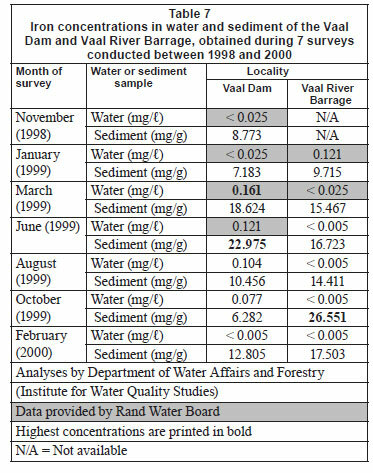 The high Mn concentrations recorded from the Vaal River Barrage water samples during the October 1999 and January 1999 surveys, respectively, were possibly the result of effluent or re-suspension from sediment. 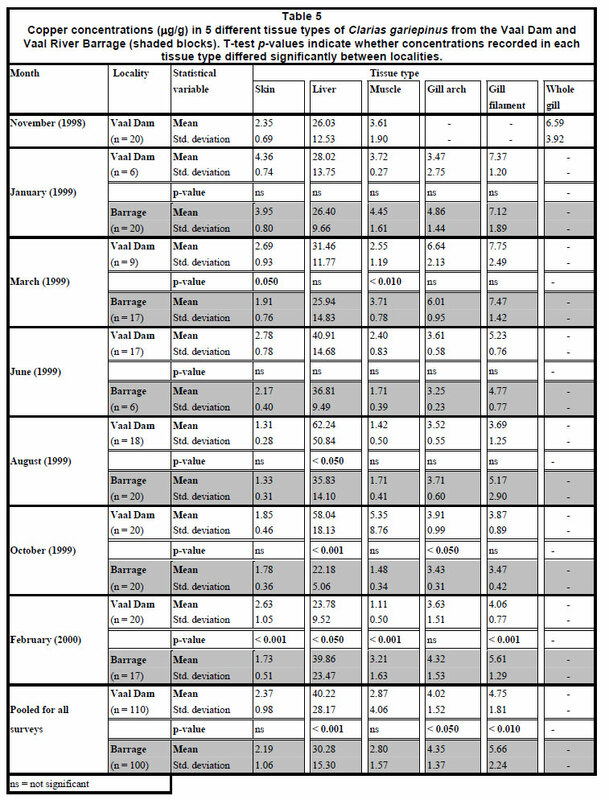 In general, metal concentrations were not much higher at any one locality, as is evident from the similar maximum concentrations recorded at both localities (Tables 1, 4, 7, 10 and 13). While significant seasonal differences in concentration were recorded for all metals, the same tissues were not consistently implicated, making any generalisations difficult. 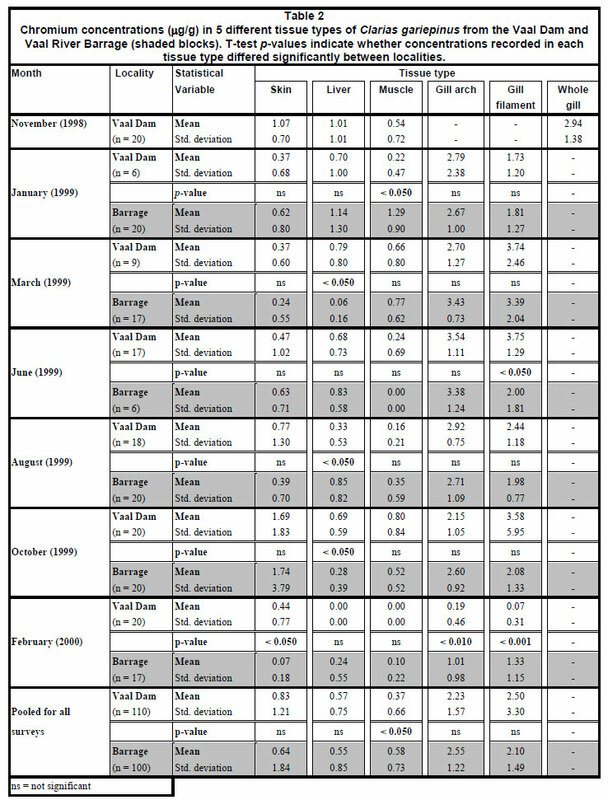 In terms of significant (p < 0.05) differences in metal concentrations in fish tissue recorded from the 2 localities (Table 16), some general trends do emerge with regards to Fe and Mn in particular. Fe concentrations were consistently significantly higher (with the exception of the March 1999 survey) at the Vaal Dam and most notably in liver and gill tissues. In comparison Mn concentrations were more often higher at the Vaal River Barrage, once again most often in liver and gill tissues. Ranking tissues on the grounds of metal concentrations also allows identification of some trends. At both the Vaal Dam and Vaal River Barrage gill filament tissue was often ranked second with regards to metal concentrations encountered (Table 17). The highest metal concentrations were most often recorded in gill arch or liver tissue, with liver being ranked first most often. At both localities the lowest metal concentrations (with the exception of Zn) were most often recorded in muscle and skin tissue. The Vaal River Barrage receives domestic and industrial runoff and effluent from the Pretoria-Witwatersrand-Vereniging (PWV) area, through streams like the Rietspruit and the Klip and Suikerbosrand Rivers. In terms of physical variables (e.g. salinity and conductivity) and macro-determinants (phosphates, sulphates, etc. 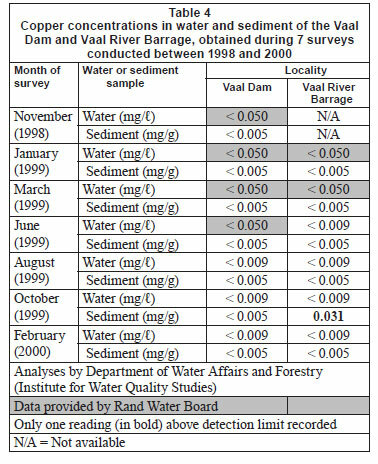 ), water quality at the Vaal River Barrage is poorer when compared to the Vaal Dam (Crafford and Avenant-Oldewage, 2009). However, contrary to expectations, metal concentrations in sediment and water recorded at both localities were similar, as is also discussed by Crafford and Avenant-Oldewage (2010) with regards to 4 non-essential metals. As was also reported by Avenant-Oldewage and Marx (2000) in the Olifants River, a large amount of variation amongst the different organs and tissues was recorded with regard to each metal. Such variability may help explain why significantly higher concentrations of metals were not consistently recorded in tissues from the Vaal River Barrage. In view of sediment and water metal concentrations, the simplest explanation would be that the biologically-available metal concentrations at the 2 localities were similar. This is also the most likely explanation. Bioaccumulation of metals in the field is however complex and may be influenced by several factors in addition to levels in food and water (Clements and Rees, 1997; Robinson and Avenant-Oldewage, 1997). A metal bioaccumulation study on catfish, by Avenant-Oldewage and Marx (2000) in the Olifants River, also reported no distinctive trends between localities with variation occurring between different tissues during different seasons at the respective locations. Avenant-Oldewage and Marx (2000) suggest that this may result from individual variation between fish (e.g. age, gender, health, genetic variability, differential stress during capture, feeding habits, previous disease and time of residence at the sampling site). Gender-specific interactions were demonstrated by Pyle et al. (2005) and Alquezar et al. (2006). To this list of variables affecting accumulation in individual fish one may also add fish size (admittedly correlated with age in most instances), as this influences the rate of physiological processes governing uptake, distribution and elimination of chemical pollutants (Afonso et al., 2007). Pereira et al. (2010b) also stress the relevance of considering distinct season and organs in the assessment of moderately contaminated systems, while Davidson et al. (2009) demonstrated that flushing rates may also be a source of variability in some systems. Otero-Muras et al. (2010) summarise the situation as follows: 'Metal bioaccumulation in fish is influenced by factors specific to the chemical and environmental conditions, the exposure route and the species'. Such variation in metal concentrations in tissues, including differences between fish species and metals examined at the same locality, is indeed not unheard of and has been reported by various other authors (e.g. Mendil et al., 2005; Dural et al., 2007; Mohan et al., 2008; Qiao-Qiao et al., 2007; Schmitt et al., 2007; Arain et al., 2008; Uysal et al., 2008; Lakshmanan et al., 2009; Su et al., 2009; Mendil et al., 2010). Avenant-Oldewage and Marx (2000) also stress possible effects of abiotic variables on metal availability and bioaccumulation. Refer to Robinson and Avenant-Oldewage (1997) for a review on the effect of major inorganic constituents on metal toxicity and accumulation. From the above discussion it can be concluded that factors influencing both metal availability and accumulation are indeed varied. Apart from the influencing factors already mentioned, the effect of interactions between metals on accumulation may be inhibitive (e.g. Kwong and Niyogi, 2009) or synergistic (e.g. Palaniappan and Karthikeyan, 2009). Storage of certain metals may even increase fish's tolerance to toxic metals (Dang and Wang, 2009). Due to the variability observed in the current study and the absence of distinct seasonal trends, detailed discussions on individual seasonal changes for each respective metal, locality and sampling occasion falls outside the scope of this paper. Possible effects of water quality and abiotic variables on metal accumulation in general at the current localities (Vaal Dam and Vaal River Barrage) are discussed by Crafford and Avenant-Oldewage (2010). With regards to accumulation of the 5 essential metals in question in fish tissue, the general order (ranked in order of decreasing concentrations) was found to be liver / gill arch > gill filament > skin / muscle. This differs slightly from what was recorded for the non-essential metals (Sr, Al, Pb and Ni) from the same locality: gill arch > gill filament > muscle > liver > skin (Crafford and Avenant-Oldewage, 2010). Very high standard deviation values were however recorded, indicating that both of the rankings obtained should be interpreted with caution. The high concentration of Zn in the skin of catfish from both localities is surprising. Yilmaz et al. (2010) also report highest Zn concentration from skin in 3 fish species from Turkey. Reynders et al. (2008) found Zn concentrations to be higher in intestine and kidney tissues from 2 fish species in Belgium, while Qiao-Qiao et al. (2007) found highest Zn concentration in gonads. Gbem et al. (2001), however, recorded highest Cr, Cu and Zn concentration in C. gariepinus liver and gill tissues. Comparison with available literature from South Africa further supports the general ranking order reflected in the current study (especially with reference to the high concentrations in liver and gill tissues). Avenant-Oldewage and Marx (2000) recorded the greatest Cr concentration in the gills and the greatest Cu and Fe concentrations in the liver. In comparison, Robinson and Avenant-Oldewage (1997) found the highest Mn concentration in gills, with concentrations of Cr, Cu and Fe being the highest in liver. Retief et al. (2009) also recorded the highest Cr, Mn, Fe, Cu and Zn concentrations in liver and the lowest concentrations in muscle. The latter trend was confirmed by Ayandiran et al. (2009) for Mn, Zn and Cu. Zn was however found to occur at higher levels in the gills by Van Aardt and Erdmann (2004), but these authors also recorded the highest Cu concentrations in liver. The liver is highly active in the uptake and storage of pollutants and non-nutritive molecules (Hopson and Wessels, 1990; Sorensen, 1991; Kimball, 1983), while active and passive exchanges occur between the animal and the aquatic environment through the gills (Eckert et al., 1988; Kargin, 1998). Several other authors also reported highest essential trace metal concentrations in fish liver and/or gill tissue. Examples include: Yang et al. (2007) for Cu and Zn; Yılmaz et al. (2007) for Cu, Fe and Zn; Vinodhini and Narayanan (2008), Al-Kahtani (2009) for Zn and Cu; Rauf et al. (2009) as well as Su et al. (2009) for Cr and De Boeck et al. (2010) for Cu. Robinson and Avenant-Oldewage (1997) speculated that the large surface area of the gills, and the large volume of water that passes over them, further facilitate metal uptake. The importance of this exposure route is exemplified by the fact that Playle (1998) deems metal-gill modelling a good framework for understanding and predicting metal toxicity to fish. Furthermore Pereira et al. (2010a) believe that gills reflect environmental contamination. With regards to concentrations in liver, Robinson and Avenant-Oldewage (1997) speculate that feeding and biology (e.g. bottom dwelling and feeding), combined with blood supply mechanisms between the liver and intestinal portal system, may help explain high metal concentrations in this organ. Mathews and Fisher (2009) also emphasised the importance of dietary exposure. The fact that metals also accumulate in some aquatic plants (Moodley et al., 2007), may compound the role fish diet may play in metal accumulation. It may thus be interesting to investigate differences in metal accumulation found in catfish (Clarias gariepinus) with that found in a species like grass carp (Ctenopharyngodon idella) from the same locality (e.g. Vaal Dam). Alquezar et al. 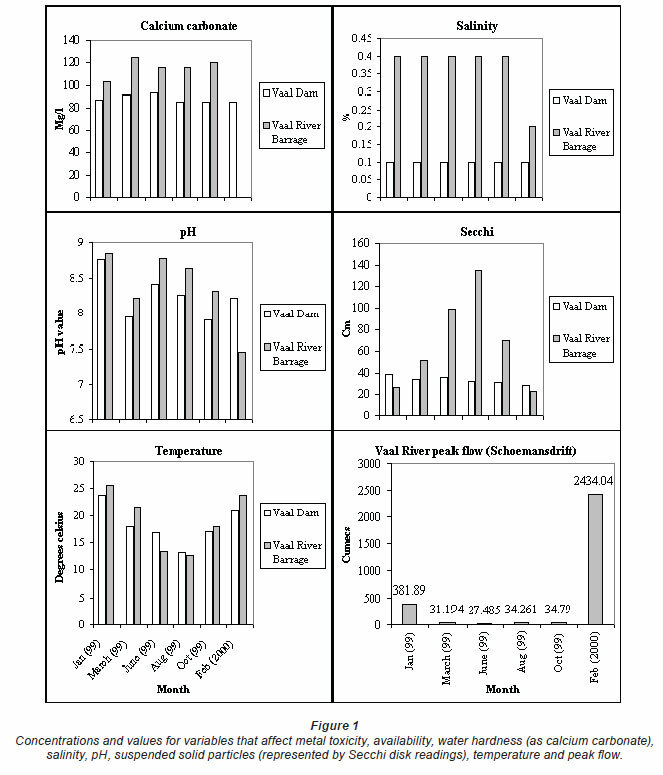 (2008), examining comparative accumulation from water and food, demonstrated that accumulation pathways differ between metals. As indicated previously, variability in metal concentration levels between different fish species and tissues are well documented. During interpretation of inter-species differences in metal accumulation, care must thus be taken not to simply ascribe a cause-and-effect relationship to any single variable, as such correlations may in fact be shared between a large number of contributing abiotic and biotic factors. Essential trace metals were recorded from C. gariepinus tissues. The quantification of apparent metal uptake (and subsequent sequestering of metals to various catfish tissues) over a relatively short time period hardly allows any conclusions to be drawn regarding the extent of bioaccumulation. This paper however provides a reference point (i.e. 'baseline data') for the Vaal River system which can be used to quantify possible metal bioaccumulation in catfish tissues during future studies. No clear trends emerged with regards to differences between localities (Vaal Dam and Vaal River Barrage), surveys or seasons. 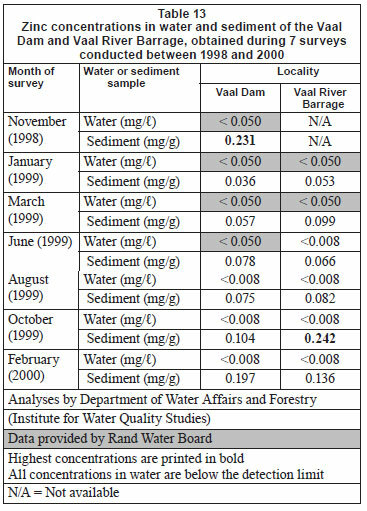 Fe concentrations were however consistently higher (with the exception of the March 1999 survey) at the Vaal Dam. In comparison, Mn concentrations were more often higher at the Vaal River Barrage. Highest essential metal concentrations were generally recorded in liver and gill arches followed by gill filaments. This general trend appears to be in agreement with trends observed by other researchers and reported in the literature. Variability in concentrations from tissues and between seasons / sampling occasions, as is indeed also reported from other studies, accentuate the importance of both abiotic (e.g. physical water quality variables) and also biotic (e.g. host physiological status, general biology and life history traits) factors that may influence the concentrations and bioavailability of trace metals. The authors would like to thank the former Rand Afrikaans University (now University of Johannesburg) for financial and logistical support, and the National Research Foundation (South Africa) for financial assistance. The opinions expressed herein are those of the authors and the NRF does not accept liability for them. We thank Rand Water for free access to their Water quality data. ARAIN MB, KAZI TG, JAMALI MK, JALBANI N, AFRIDI HI and SHAH A (2008) Total dissolved and bioavailable elements in water and sediments samples and their accumulation in Oreochromis mossambicus of polluted Manchar Lake. Chemosphere 70 1845-1856. [ Links ]. Received 31 August 2010; accepted in revised form 1 February 2011.